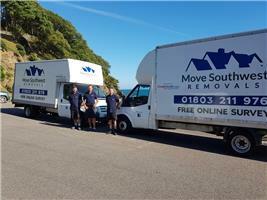 Move Southwest Ltd - Removals/Storage based in Torquay, Devon. Being a local family run company has many benefits to our customers. We offer a unique service focusing on our customers. From turning up at a time that suits you, to packing your children's favourite toy box last for quick access at the other end, we go that extra mile. We understand that your needs can be changed last minute and we're ready to adapt our services quickly, so your removal runs smoothly and as stress free as possible. Move Southwest offers full/part packing services. Our attention to detail ensures that we don't ever compromise standards. All the boxes will be labelled so they end up in the correct place at the delivery destination. Move southwest provides an expert service in helping you move short, long and international distances. We offer our clients our wealth of experience and knowledge of the removals industry. Regardless of the size of your move, our expert team are always happy to help. As a well-established family run company offering an excellent standard of service to each of our clients. Our staff are experienced removals experts who are punctual and reliable. Our pricing is competitive and no job is too large or too small for our expert team. So if you require a professional service for packing and removals remember to call Move southwest.